With Autodesk’s “Get Current” promotion you can save up to 50% by moving to Autodesk 2011 software. 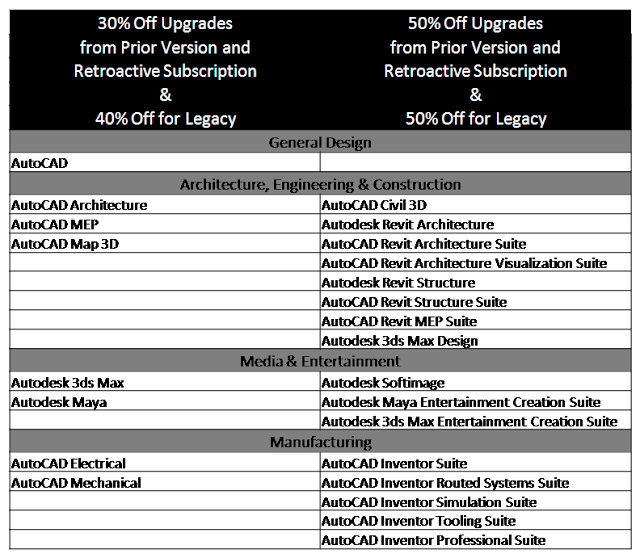 This promotion includes upgrades, crossgrades**, retroactive subscriptions, and Legacy purchases***. Subscription Only products that have been retired are included in the Legacy portion of this promotion****. This offer expires Jul 18, 2010. The discounts are 30%, 40%, or 50% depending on the product you are moving to and the type of transaction to get there. 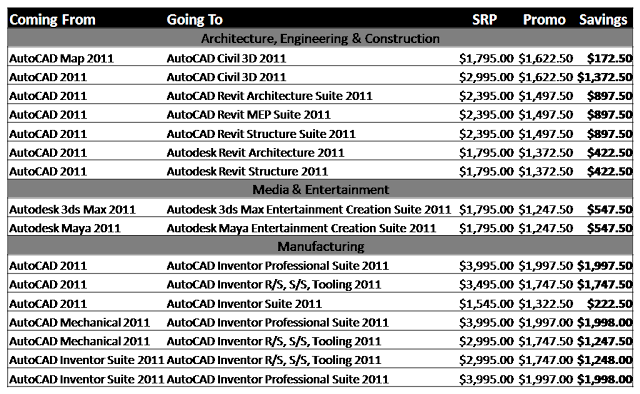 The FAQ listed below has a chart of what discounts are available for each product. 3. Are upgrades from 2011 versions included in the Get Current Promotion? Autodesk has taken care so that customers upgrading from 2011 versions are not charged higher prices than those taking advantage of the Get Current Promotion. As a result, a number of cross-grades from 2011 versions have been discounted at a variable percentage to match upgrades from prior versions. Where an upgrade from a 2011 product was already less than the Get Current pricing, no discount was applied. You will need to verify this pricing with your reseller. *For those of you who are new to CAD/BIM Management of Autodesk products, Autodesk supports the current release of software (now 2011) and three releases back (2010, 2009, 2008). They just retired 2007 on Mar 15, 2010, so 2008 software is next on the chopping block. 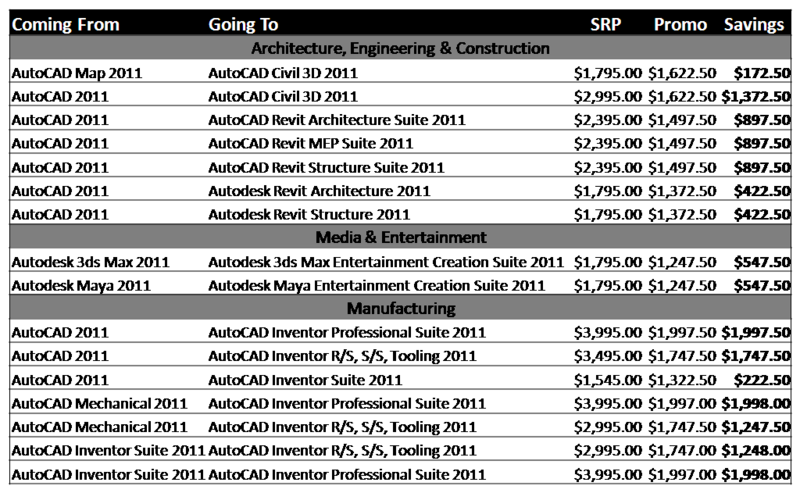 ** A crossgrade is a move from one software product to another, e.g., a crossgrade from AutoCAD to AutoCAD Revit Architecture Suite. Autodesk has started lumping these transactions into the term “upgrades”. *** Retired software cannot be upgraded. 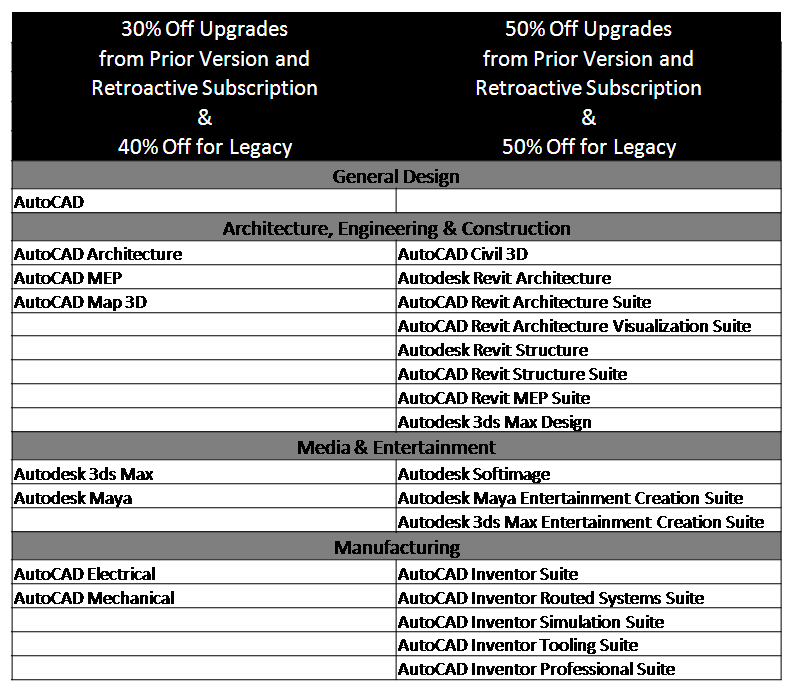 Autodesk’s Legacy Program allows discounts on new software licenses if you have retired software licenses (back to R14). For each retired license you can typically get a 30% discount on a new license of software. Other terms and conditions apply – for example, retired AutoCAD LT licenses are not included in the Legacy Program. **** Typically, Subscription Only products are not included in the Legacy Program. With Subscription only products you either stay on subscription or pay retroactive subscription fees to get back on subscription. Once your version is retired you had to purchase new software to get current. Autodesk is making an exception for this promotion.